What is a crazy squirrel you ask? Well it's the name of my make-believe productoin company. I like to make amateur films with my camcorder and computer, for some reason I try to do the great big epics instead of doing small short things to start with. But it's too late to start over. But, back to the story. Picture it, New York City, Washington Square Park, May of 2003. I went to NYC w/ my friend Sam to go to his friends birthday party. We went into the city one day and were walking through the park. 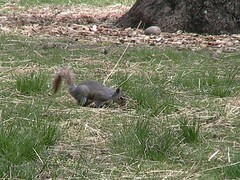 We saw this squirrel and I decided to "click" at it (like you do to get a dog's attention kind of thing). Well this squirrel came right up to us about 3 feet away and somehow ended up on a fence staring at us eye to eye. We screamed like girls as the squirrel jumped to the ground at our feet and we looked like one of those Bugs Bunny cartoons where the feet move, but the body doesn't. After we stopped giggling, I looked across the path and there was a gentleman trying to read the paper, but he had an obviously big grin on his face, but he was trying to hide it. I looked at him and said "Oh, no. Go ahead and laugh, that was damn funny." So we talked about that "crazy squirrel" and somehow I picked it up and said, "that's what I'm going to name my production company"
I had a squirrel do something similar on the Notre Dame campus. I was walking, he was walking-- we had a faceoff. He stood up on his hind legs in the middle of the sidewalk and just stared at me. I walked off the sidewalk and around him. Scary squirrel! So glad he came back. He was sooo cute, haha. What a great show that was, 3 DVDs were not enough! !